There very few things in life that can compare to a good laugh. Whether we depend on movies, standup, television, or even each other, comedy is rarely out of our reach. For some of us, being funny just comes naturally. Comedic talent mostly relies on natural charisma, showmanship, and impeccable timing. Like many class clowns and just all around wild characters, Big Scoob makes it look easy. Scoob’s over-the-top personality makes him loud, obnoxious, and pretty damn funny. It doesn’t seem to matter if Scoob is confronting tour managers or arguing classic cars, he never misses an opportunity to be a Damn Fool. Of course, big men and comedy is nothing new. Like a lot of funny big men before him, Scoob’s best moments come from his spontaneous reactions. Taking a look back at some of comedy’s biggest damn fools, it’s easy to see where Big Scoob may have gotten some of his bravado. Disgusting, crude, and wildly inappropriate, John Belushi was one of comedy’s first big men to make a living from acting like a damn fool. The Chicago native began his successful career as one of Saturday Night Live’s original cast members in 1975. His most famous portrayals on the show were motivated by his real life characteristics and outlandish behavior. 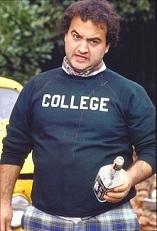 Belushi’s role came in the character of Bluto in the giant comedy hit Animal House. Bluto, a drunkenly ignorant vagabond, quickly became the movie’s breakout character. On screen, Belushi personified loud and brash figures, but it was his off screen antics that made him such a riot among his peers. Belushi’s tendency to party hard in between movie and television shoots earned him a reputation as a big party animal. Many of his wildest stories went on to fuel his onscreen personas, including his part in the smash hit Blues Brothers as Joliet Jake. From his hilarious depictions of society’s degenerates to his real life debauchery, Belushi’s legend raised the bar for all future comedians. It is hard to make mention of over the top characters in comedy without thinking of Chris Farley. The plus sized actor became one of Hollywood’s biggest stars in the 1990’s. He began his television career with Saturday Night Live in 1990, and immediately stood out as a fan favorite. Farley’s comedic style relied heavily on his physicality, often falling through tables or running through walls during his sketches. 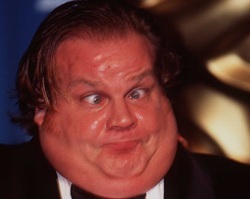 Farley never shied away from his weight problem, as it was often the focus of his funniest moments on the show. Farley’s taste for real life comedy made his cast mates susceptible to pranks around the office, and he was frequently noted as being big on prank phone calls. 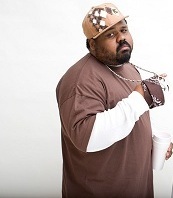 Following his departure from the show, Farley rose to fame in his biggest roles with Tommy Boy and Black Sheep. The two films made Farley a huge star, and catapulted him into movie success. Farley’s ability to convincingly play idiot slackers was part of what made his comedy so special. His hilarious use of physical comedy made him one of the most influential big men of the last two decades. Big Scoob may not consider himself a comedian, but it’s hard to argue with the evidence. Between his unforgivingly opinionated rants and his brash nature, Scoob naturally comes off as a hilarious individual. The self proclaimed Damn Fool is never without a drink in his hand, which more often than not drives his wild personality. Scoob’s best material comes spontaneously and when he is in the presence of his peers. Scoob makes no exceptions, as anyone from fans to artists are subject to his foolish ways. From hosting his own internet show, Damn Fool TV, to appearing on SM Live, Scoob can always guarantee he’ll keep the laughs coming. Scoob now shifts his focus towards the release of Damn Fool on May 3. The follow up to Monsterifik promises to give fans a new perspective on Big Scoob. The biggest fool of them all, Scoob may enjoy getting laughs outside of the studio, but when it comes to his music, his lyrical abilities are nothing to joke around with. 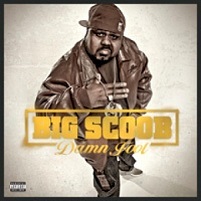 Don’t forget to pre-order your own copy of Big Scoob’s Damn Fool right here.